Samaritan’s Purse has been in the trenches serving the people of this war-weary and often overlooked region for more than 20 years. 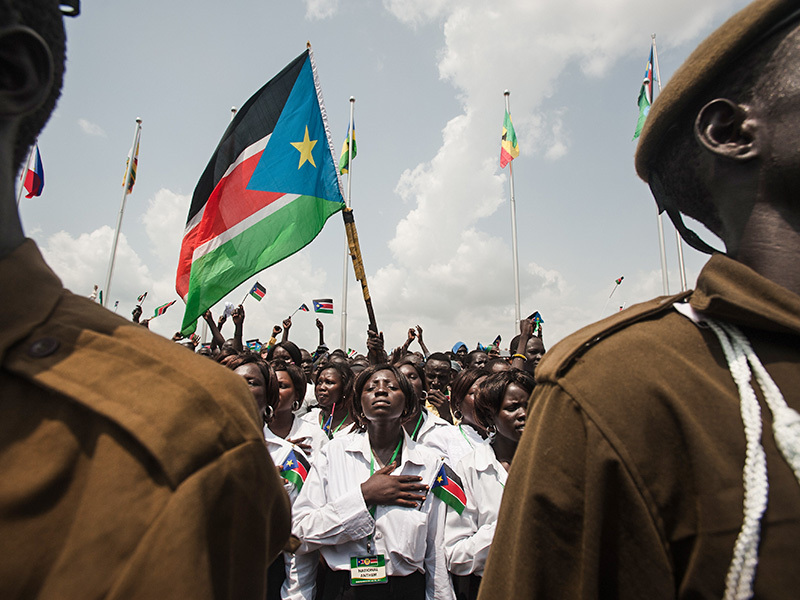 There were such high hopes for South Sudan when it became the world’s newest country in 2011. But those dreams were dashed when a fierce internal conflict erupted two years later and spread like a wildfire throughout the nation. A negotiated peace agreement raised hopes once again, only to be shattered in July 2016 when fighting broke out in the capital city of Juba. This violence, combined with a deteriorating economy and poor harvests, has caused the people unbearable suffering. In February 2017, famine was declared in parts of the country, affecting about 100,000 people. One million more are on the brink of famine. Fighting between various groups continues and the economy is crashing. In March, some of our staff were detained by armed personnel for a short period and then released. Nevertheless, as we have for more than 20 years, Samaritan's Purse staff continue showing the compassion of our Savior and sharing the hope of the Gospel. In Jesus’ Name, we’re providing food, clean water, and medical care to hundreds of thousands. Teaming with local churches, we’re teaching people to read the Bible, leading reconciliation and peacemaking workshops, and training counselors to help people process the terrible events they've experienced. As we work, we thank God for doors that have opened to present the Good News and to disciple new believers. Our staff are serving in multiple locations across the country, providing food, water, medical care, and ministry in Jesus' Name. Read the articles below and thank God for how He gives people hope in the midst of great strife. 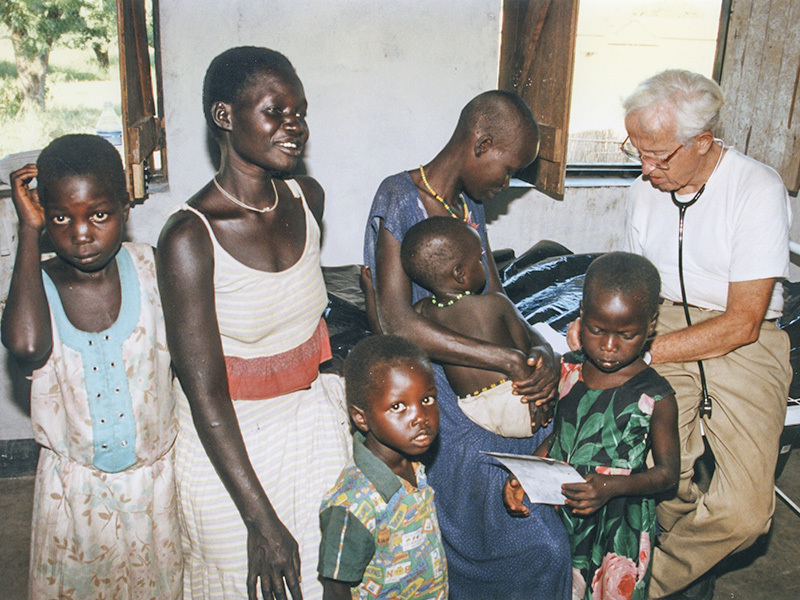 Since 1993, Samaritan’s Purse has reached out to the people of South Sudan. In this timeline, trace our history of effective ministry in the context of key country events. 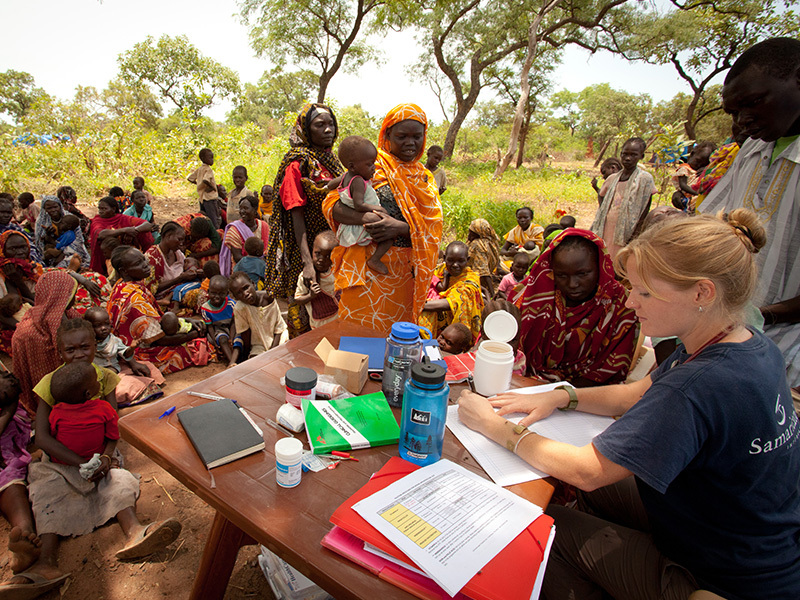 In response to an outbreak of relapsing fever, Samaritan’s Purse sent a medical team to a village in eastern Sudan. 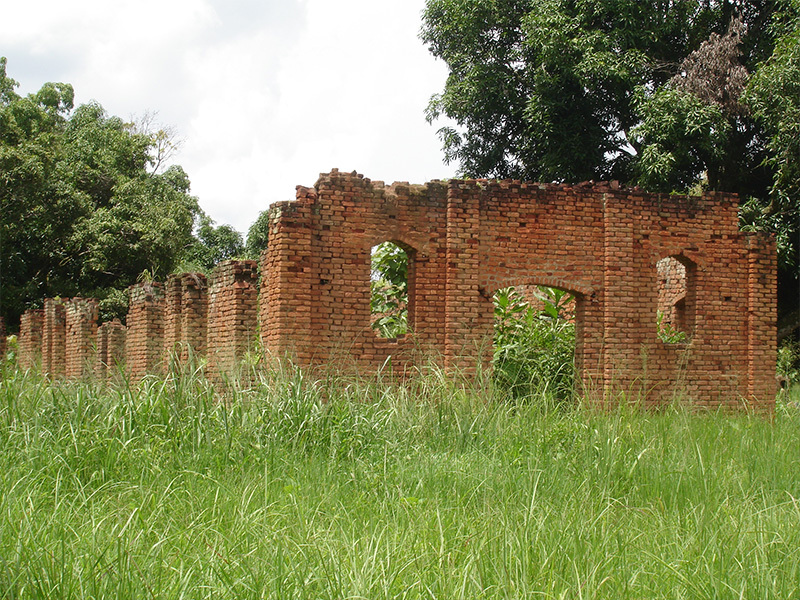 The team also treated patients wounded in the civil war, mothers needing cesarean sections, victims of crocodile bites, and numerous accident casualties. Samaritan’s Purse staff members were briefly held hostage by rebel forces fighting in the area. The team managed to contact the United Nations and arrange an airplane evacuation to Kenya. Though Samaritan’s Purse had succeeded in halting the spread of relapsing fever, operations in southern Sudan ceased. In response to the persecution of Christians in southern Sudan, Samaritan’s Purse decided to revive programs in the country. 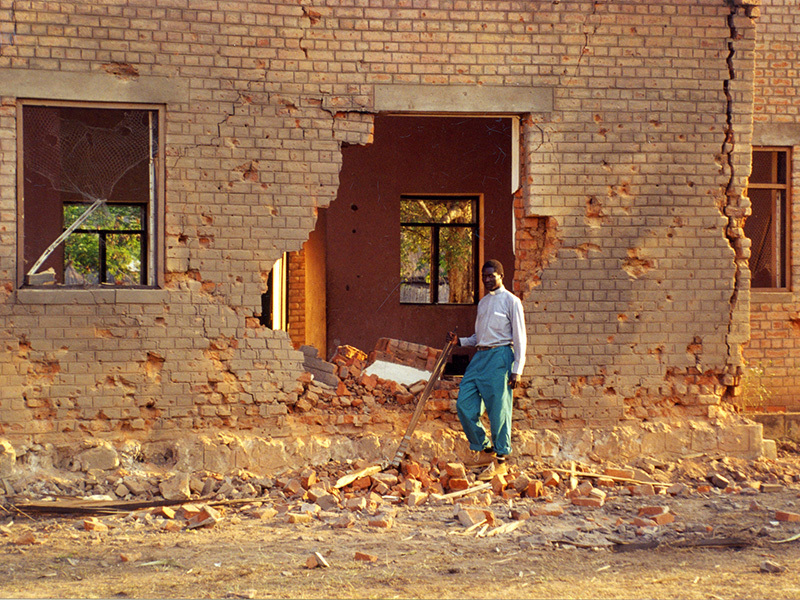 We began working to rebuild a hospital in Lui, which had been surrounded by landmines. When we arrived, there was one nurse providing medical services for the entire community. Samaritan’s Purse accepted the responsibility of opening and operating a hospital in Juba. Within the first couple of months of operations, the hospital had seen 7,000 patients and performed 150 major operations. Lui Hospital was moved into a refurbished building and staffed largely by volunteer doctors and nurses through World Medical Mission. On Christmas night, government soldiers infiltrated the area and were captured planting mines on the road and dirt airstrip used by the Samaritan’s Purse team to serve the hospital. Several bombing raids by the Sudanese government damaged the hospital in Lui and killed three villagers in the local market. 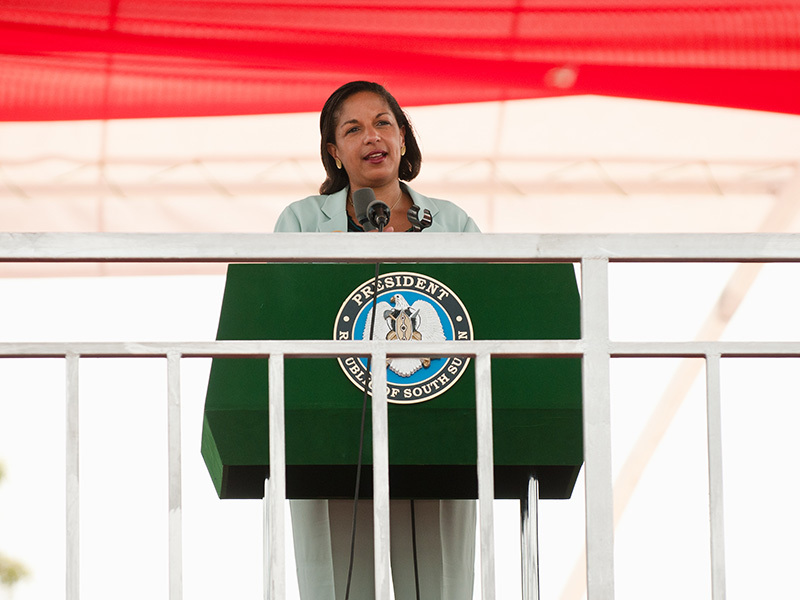 Susan Rice, the current National Security Advisor and previous Assistant Secretary of State for African Affairs, toured the hospital in Lui with tears in her eyes. “[Samaritan’s Purse] is doing remarkably good work in very difficult conditions,” Rice said. She circumvented the government in Khartoum to visit our work without official permission. Franklin Graham traveled to Lui Hospital, which had treated 200,000 people since 1997. 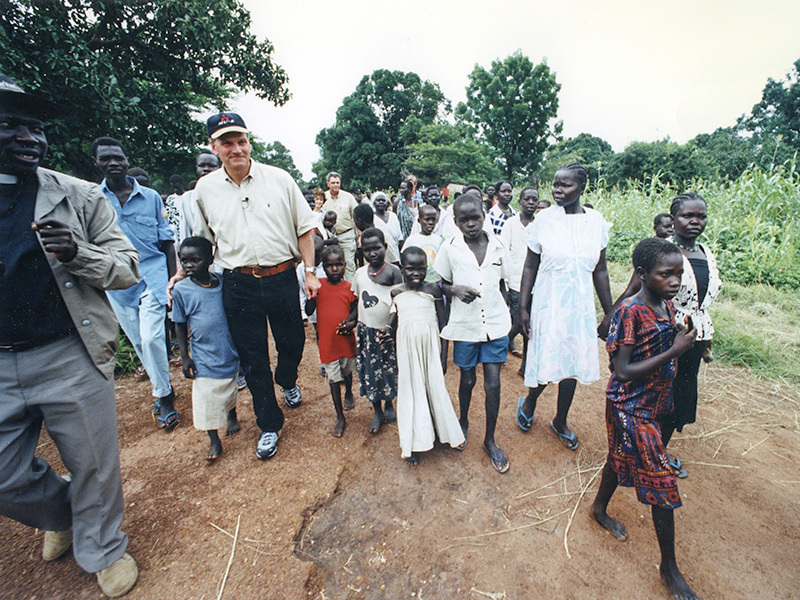 While in Sudan, Graham also flew to Akot, where an ill-guided U.N. program dumped more than 1,600 boys, most under the age of 12, near a clinic operated by Samaritan’s Purse. We provided food, clothing, and shelter for 400 of them. We began working at Kurmuk Hospital, where there was no water and no adequate light source. Even seasoned missionary doctors were horrified by the conditions there. Sterilization was done in a pressure cooker over an open charcoal fire. We fed thousands of students at two Islamic schools in southern Sudan after the government cut off food shipments to the facilities. We used camels and trucks to ship in tons of sorghum, a staple of the Sudanese diet. One of the grain trucks ran over a land mine, but our medical team saved the driver’s life. 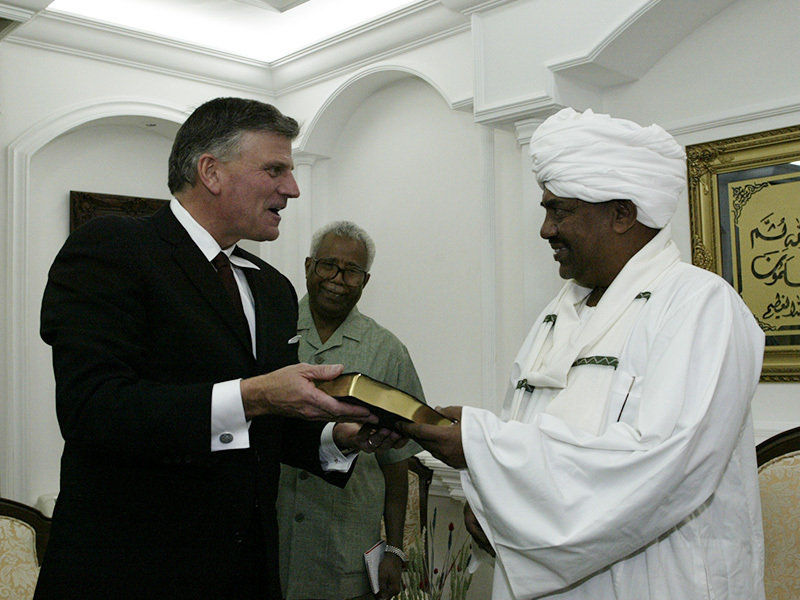 Sudanese President Omar al-Bashir agreed to a meeting with Franklin Graham after a previous meeting was aborted in the wake of the September 11 terrorist attacks. Bashir invited Samaritan’s Purse to distribute shoebox gifts and gave permission to begin humanitarian work in Darfur. 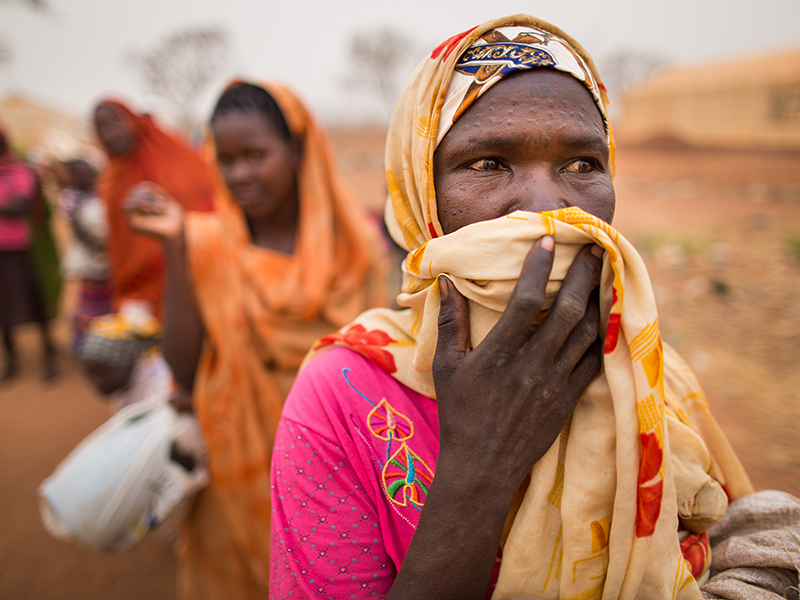 Samaritan’s Purse sent a team, including a doctor, and our DC-3 cargo plane to the Darfur region to take food, medicine, and other supplies to more than 10,000 suffering refugees. For thousands of children and adults who walked miles across scorching sands with no shoes, we delivered sandals to protect their feet from the blistering desert heat. Sudan and the rebel forces of southern Sudan signed the Comprehensive Peace Agreement, which guaranteed the southern Sudanese certain rights and led to the eventual creation of South Sudan. John Garang, the leader of the southern Sudanese liberation movement, was killed in a helicopter accident in July of the same year. The loss of Garang was detrimental to the leadership structure of southern Sudan. 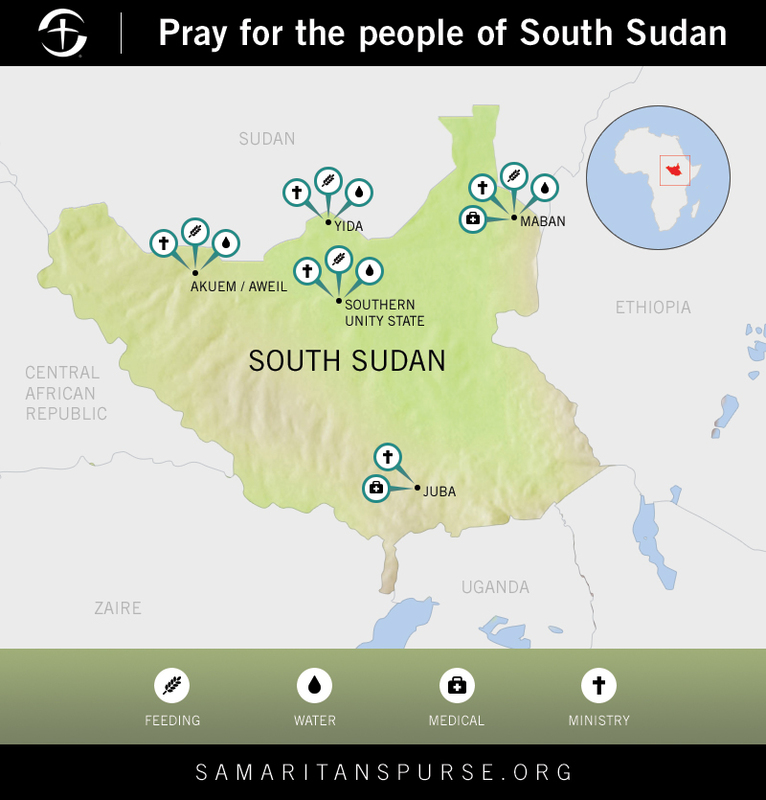 Samaritan’s Purse teams began crisscrossing southern Sudan to identify churches that were destroyed during the war. When the program ended in 2010, more than 500 churches had been rebuilt. 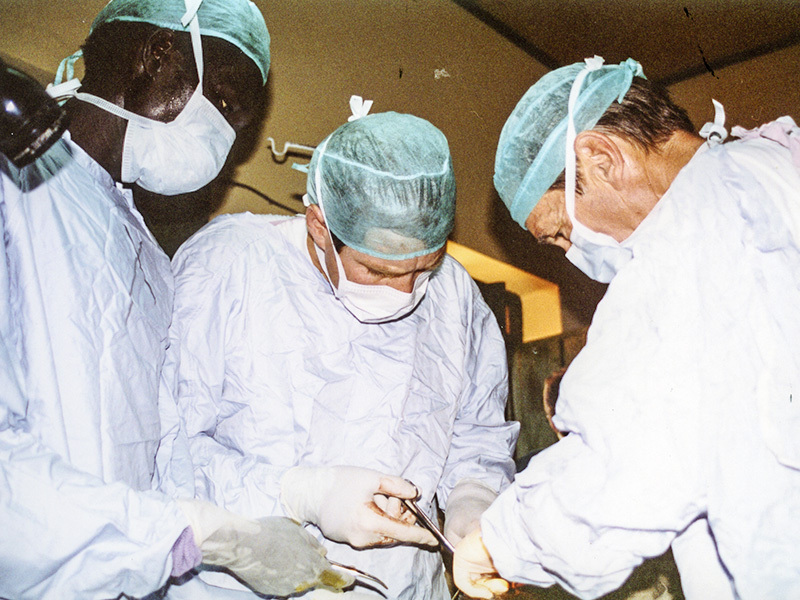 The Sudan Physician Regeneration program sent a group of 12 Sudanese physicians, who were originally “lost boys,” back to Sudan from Canada to serve as doctors in the war-torn country. Since their degrees were not recognized, the men ended up in various low-end jobs. Samaritan’s Purse found the physicians, helped them retrain, and provided an opportunity to qualify for their medical licenses in Kenya. 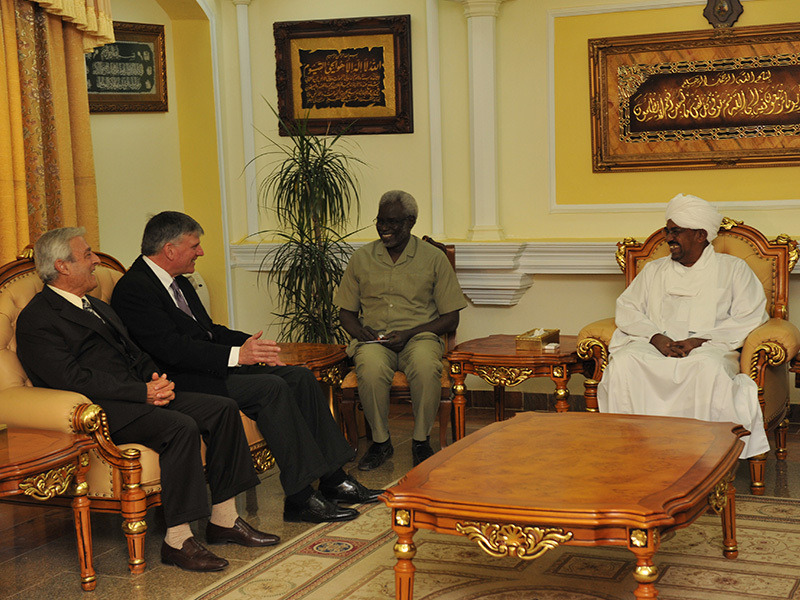 Franklin Graham met for the second time with Omar al-Bashir, the President of Sudan. During the meeting, Bashir agreed to allow Samaritan’s Purse to begin a church rebuilding project. Omar al-Bashir was charged with war crimes by the International Criminal Court for the government’s scorched earth policy in Darfur. 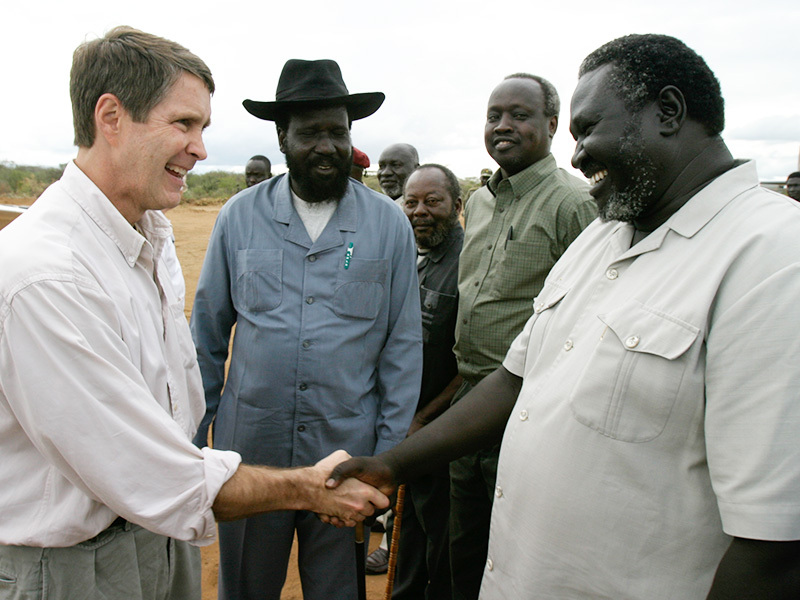 Hours before the charge, Graham provided Bashir with a list of requests and concerns written by southern Sudanese pastors facing persecution. After Bashir’s indictment, Sudan kicked out many different organizations, but Samaritan’s Purse was allowed to continue operations. 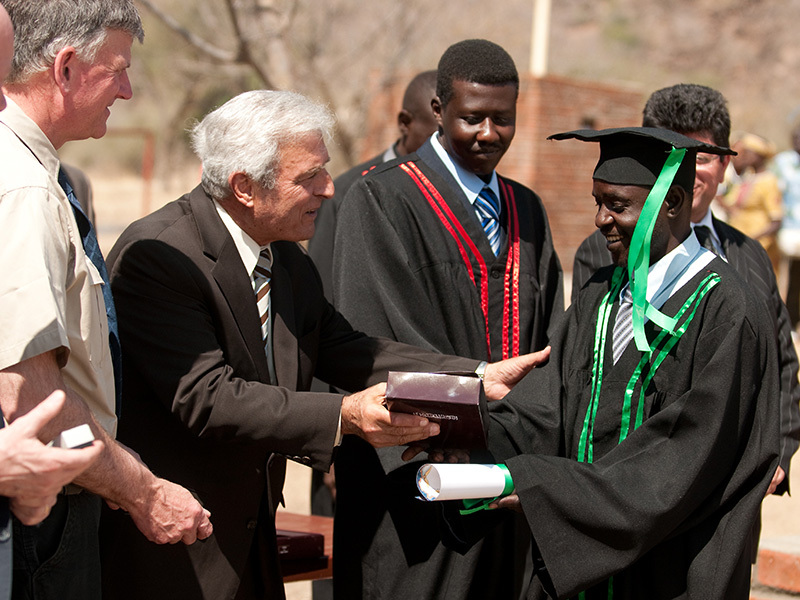 Franklin Graham and longtime friends of the ministry celebrated the first graduates of the Samaritan’s Purse Bible School in the Nuba Mountains. South Sudan became an independent country. Samaritan’s Purse staff members joined more than 3 million people to participate in the celebrations. Franklin Graham met and prayed with South Sudanese President Salva Kiir, and several staff members were invited to an exclusive dinner with international leaders, including former Secretary of State Colin Powell and Susan Rice. Samaritan’s Purse brought in medical aid, food, shelter, water, and other support to 2,000 refugees stranded in a swamp. Now known as Yida refugee camp, the area houses more than 73,000 internally displaced people. 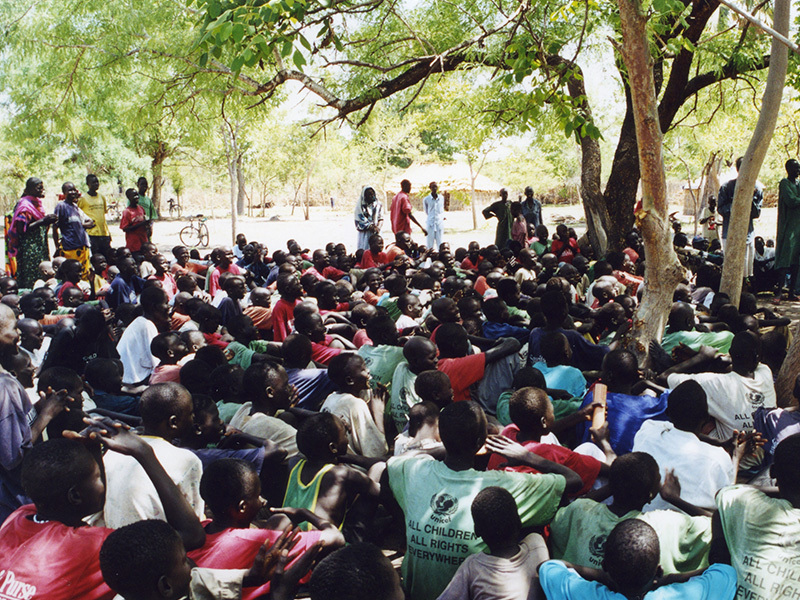 Around 130,000 people have been displaced by conflict in the Nuba Mountains. 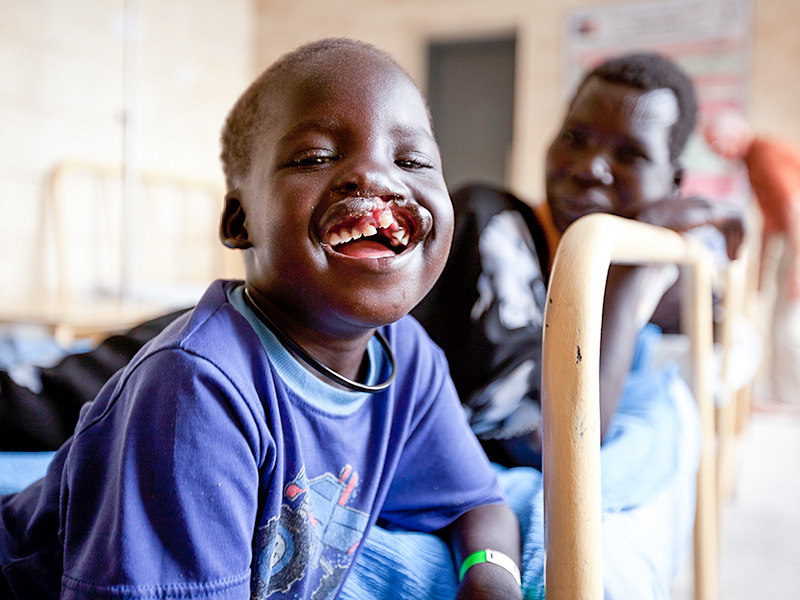 A medical team arrived to provide cleft lip surgeries for people in South Sudan. Those with cleft lips are often named “Deformed” and excluded from society for fear that they are cursed. Violence erupted in South Sudan between the forces loyal to President Salva Kiir and former Vice President Riek Machar. The conflict quickly developed into a full-scale civil war with tribal influences. Kiir is from the Dinka tribe, and Machar from the Nuer. Machar was sworn in again as Vice President of South Sudan. Kiir and Machar came together as part of a peace agreement, though each man still controls his own army. After a brief period of peace, South Sudan is at war once again. Forces loyal to Kiir and Machar resumed their conflict after a dispute between their respective forces erupted into violence. After fighting more than 20 years for independence and freedom, the world’s newest nation has descended into chaos after five years. South Sudanese refugees start arriving in Uganda after an outbreak of violence in July. Thousands of new refugees are registered every day. Bidibidi, one of the largest refugee settlements in the world, reaches capacity with over 272,000 people. The settlement in Uganda opened in the last months of 2016. The international community makes the announcement that certain regions of South Sudan have reached famine levels of food insecurity. A group of Samaritan’s Purse national staff members were detained, and then released, by armed personnel in South Sudan. 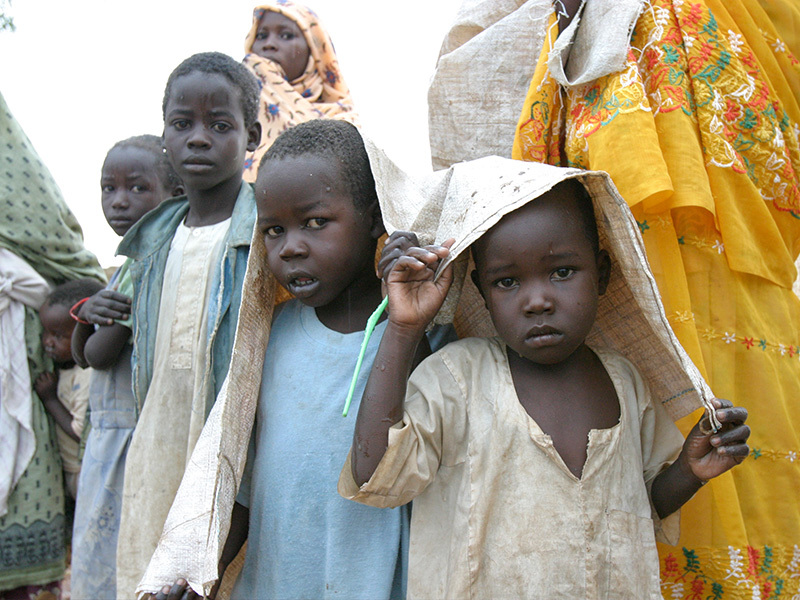 At this time, there are now over 900,000 South Sudanese refugees living in Uganda. The vast majority are women and children. There are 1.82 million refugees from South Sudan scattered throughout East Africa.